Hedgehog cactus (Echinopsis spp. ): growing, planting, caring. A cactus that looks like a sea urchin. Scientific name : Echinopsis spp. Echinopsis - the hedgehog cactus, sea-urchin cactus or Easter lily cactus - is a genus of cacti native to South America. They are large and treelike cacti, one exception being E. chamaecereus known as the peanut cactus, and resemble sea urchins - with their dense coverings of spines. To recognize sea urchin cactus: - They sting! - They have a cylindrical floral stem, ribbed, garnished with spines arranged in rosettes. - Their flowers are very colorful, large and fragrant. Plant your cacti in a light, porous and well-drained substrate to prevent water from stagnating around the roots - enriched with sand, it's a great idea! Cacti need as much light as possible. In pots inside, place them in front of the windows so that they are beautiful even in winter. In winter, they will prefer a cool room. In summer, do not hesitate to take them out if the conditions are favorable. 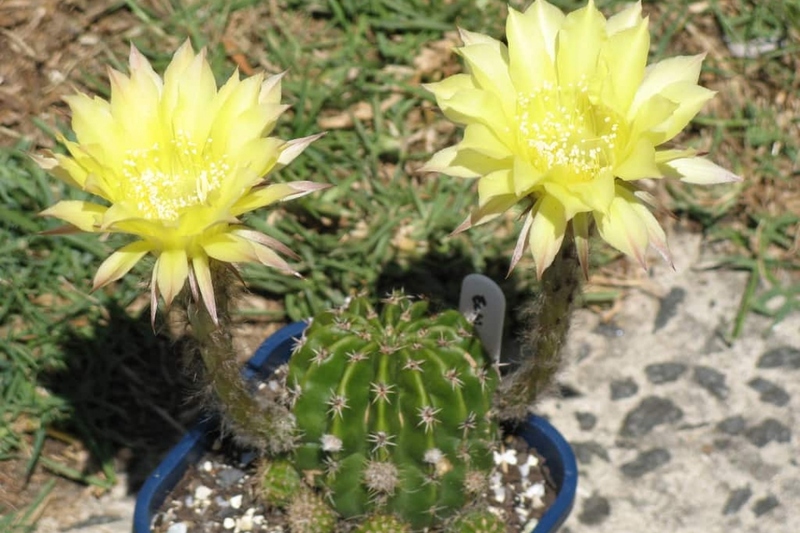 Cacti tolerate infrequent watering, and hate stagnant water, especially in heavy soil. The rate of watering varies with the season, as your cactus "evaporates" more when it receives a lot of light. How to water? You can use tap water or reclaimed water. Sprinkle gently, and if you see water in the dish, empty it after several minutes. Cactuses can live or survive with very little nutrients! But if you want beautiful vigorous plants, a supply of fertilizer can help. Use a liquid fertilizer, geranium or tomato fertilizer is just fine. The special fertilizer for cacti is almost identical, but more expensive! Fertilize on every other watering during the growing season. Repot at the beginning of the beautiful days, at the end your cacti's winter rest, right before they resume their growth. This allows them to recover from the inconvenience, and to be ready for a new year. If you missed the moment, it's not very a big problem, you can do it all year! Repot your cacti every 3 or 4 years with potting soil mixed with a lot of sand. Know that the growth is related to the frequency of repotting: a cactus never repotted will stop growing! When repotting, remove the old soil and dead roots as much as possible, while being careful not to damage the larger ones, which are alive. To facilitate drainage, place a layer of coarse sand in the bottom of the pot, or even pebbles for large plants. Once the repotting is complete, wait one to two weeks to resume watering, so that the damaged roots heal. Otherwise, there is a risk of rottening the plant. The number one enemy of cacti and succulents is decay due to too much humidity! Do not forget to be reasonable with watering, and especially to give your cactus a well draining substratum! Other fungal diseases can happen, especially botrytis. Do not hesitate to prune the sick parts of the plant to prevent the spread of the disease. Mealybugs and other mites are particularly fond of succulents. Sprays with soapy water will get rid of a large part of them. Do not forget to disinfect your equipment regularly (pots, pruning shears...) to avoid contaminations. Bring it inside well before the first cool nights, in a room not too heated so that it "feels" that it is winter: 5 to 10 ° C at night without artificial light! You should stop all watering until spring. Do not hesitate to take out your cactus for the summer! If it has spent the winter in the shade, just avoid placing it directly in full sun, acclimate it more gently ... You should put it back inside at the end of the summer. Cacti are easy to propagate by cuttings. Cut a piece cleanly and let it dry a few weeks before planting it in open soil and you're done! Choose a stem that is quite tender, neither too old nor too young and without any trace of disease. Leave the cutting outdoors, in a warm place, for a few days to dry. Then put it in a terracotta pot, with a very light mixture composed of a third of potting soil or peat and two thirds of sand. Water and then place the pot in a mini-greenhouse, at a temperature of 15 to 18 ° C, in a well-lit place, warm and moist.